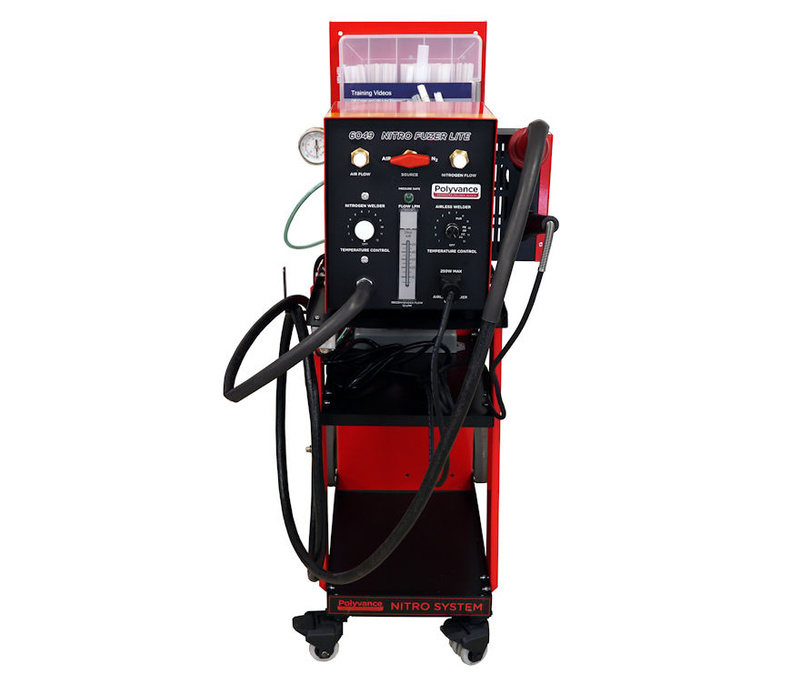 The 6049-C Nitro Fuzer Lite Plastic Welding System combines a simplified nitrogen welder with a traditional airless plastic welder. By combining these welders into one package, it allows you to economically make nitrogen welds to virtually any automotive plastic. 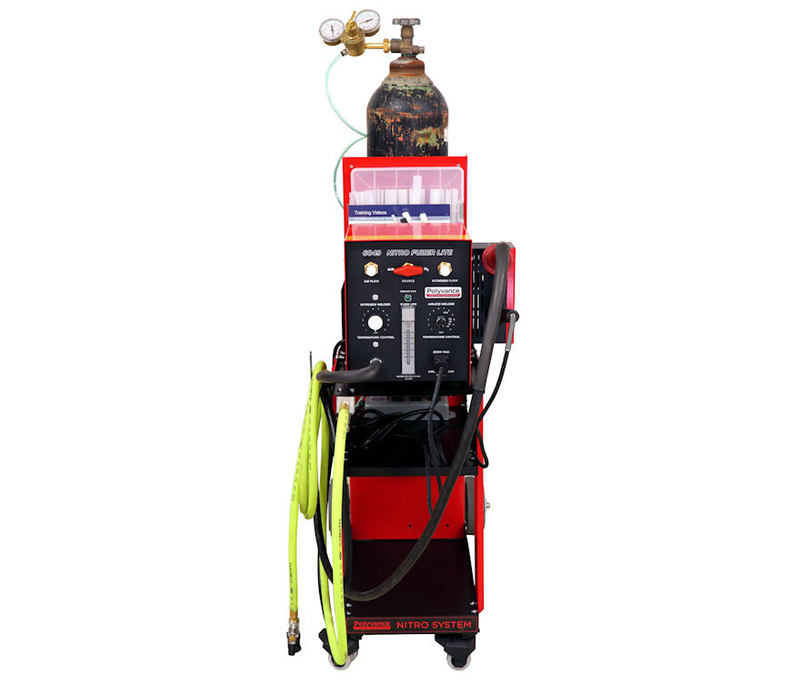 The Nitro Fuzer Lite is designed to be used with compressed air and a nitrogen bottle to make the strongest possible welds, or it can be used with the optional 6066 Nitrocell nitrogen generator for a limitless supply of nitrogen. Unlike some competitive products, the 6049 features precision flow control so the user can match the flow and temperature to substrate types and thicknesses. The flow and temperature can be reduced to a very low point in order to weld thin, fragile substrates, something others cannot do. However, when welding very thick substrates and needing a little extra push, the temperature and flow can be increased greatly, to allow more heat to be transferred to the weld. A flow gauge gives the welder a repeatable reference over how much gas is used in the welding process. To extend heating element lifespan, a low-pressure safety switch is incorporated into the system, shutting off the power to the heating element if the air flow drops below a safe level. 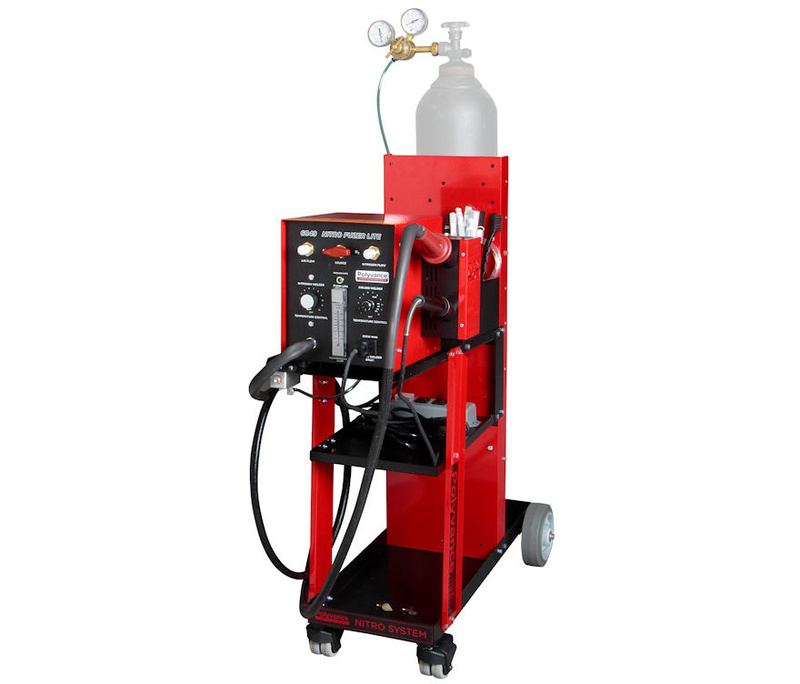 The integrated airless welder is ideal for smoothing out welds,repairing thermoset polyurethane, and adding reinforcing mesh to welded thermoplastic parts. In order to reduce the cost of the welder, the welder and cart will be shipped in two boxes. This means the cart will need to be assembled. We have detailed instructions in the box, as well as a video, to help you assemble the cart. Speed: Complete repairs in a fraction of the time of 2-part adhesives. Weld 4 to 6 inches per minute, then immediately finish, prime, and paint. No waiting for adhesives to cure. Versatility: Do repairs that are not possible with adhesives. Mounting tabs (thick or thin), grille bars, high-stress areas, flexible tabs, and fender liners. Not just for automobile plastics. Cost Savings: An average 6 inch repair costs less than $2.00 when welded. With a 2-part adhesive, you pay more than that just for the mixing tip! The total cost of the same size adhesive repair can be over $40.00! Ease: Repairs are simple to do. Your techs already have the skill set, with this they have the tools. Estimating Options: Gives you more flexibility in the estimating process. Save total losses. Get an edge on the competition. A bargaining tool with insurance adjusters. Keep Profits in Your Shop: No need to replace bumpers, headlights, and other plastic parts. Keep the labor dollars in-house. Blend in the Panel: Repair the damage to the bumper and blend the color in the panel. Avoid the risks and costs involved with blending into the undamaged fenders. Insurance Relations:Show you are on the side of cost savings while increasing your profits at the same time. Do a QUALITY repair, become an ally of the adjuster, lower cycle times, and help drive additional work to your shop. Create Loyal Customers: 25% of a shop’s business is customer pay. Save them money on the small hits and they will return to your shop with the big hits. Avoid Fit Issues: Why install an aftermarket cover when you can easily repair the OE? Plastic Use to Grow: The amount of plastic parts on cars will continue to grow. This means more repair opportunities. Factory Support: Plastic is what we do at Polyvance. For over 30 years we have been the leader in product development and problem solving. We have the proven products you need from start to finish. Plastic repair doesn’t have to be difficult. Stainless steel tip cleaning brush - Use this to clean the tip of the airless welder.